Peel, core, and chop apples into 1-inch chunks. Put apples and water in a medium saucepan. Bring to a boil, cover, reduce heat to low & cook about 15 minutes, stirring occasionally. Mash with potato masher to desired chunkiness. 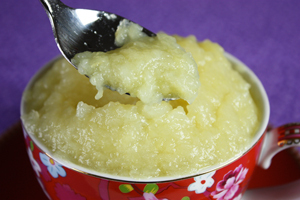 7 Comments on "Homemade Apple Sauce"
Jenny I now about appels but try it with pears,you love it. 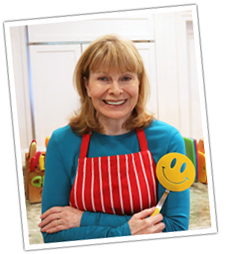 Jenny I just want to say I used to watch you years ago on your talk show..love loved you, and now this cooking blog Ilove your humour and your cooking videos. Dzienkuje Pani, for this simple reminder. I had a basket of gala apples in my garage and now I have some jars of homemade applesauce. I made some chunky, some smooth and some with a hint of cinnamon. These will go great with our pork roast. (PS- try adding a little of the applesauce to your sauerkraut when you cook it. It gives it a nice complimentary sweetness). Smacznego. I love your blog. It is one I look forward to because it is uplifting, lively and fun. You don’t take yourself too seriously which make it relaxing to be a part of your blog. Questions regards to apple sauce- how do you keep the sauce from turning brown if you are making it ahead of time? I don’t know what to tell you because mine does not turn brown. I usually keep it for a few days in a plastic tub or a big cup, covered & refrigerated of course, and it never changes color. You are absolutely right – homemade applesauce doesn’t need sugar. This recipe is perfect the way it is!